Creating a brand in the wedding industry can be difficult – there’s a lot to consider! Your business needs a logo, consistent messaging, pricing details and more just to create a Storefront or website. Though it’s very easy to purchase stock photos to help boost the imagery on your website, it’s a best practice to feature photos of your own work to show off your expertise! Before you reach for that cell phone camera, though, consider getting some high-quality images. Featuring high-resolution, professional photos that showcase your business is an important way to make your Storefront and website more appealing to visitors. According to Air BnB’s own research, listings with professional photos are booked 2.5 times more frequently than those without. Not only are photos important for couples searching for their Pros, they’re also important for real wedding submissions. Any type of wedding professional can be featured in WeddingWire publications or on Project Wedding, but we do require at least 75 high-quality images for each submission. Our Editorial team will also seek out Pros on WeddingWire whenever they need to provide examples for our consumer audience, and having a lot of professional photos on your Storefront will help your wedding business stand out. Make it a point to meet the photographer at each wedding or event you do. Whether you meet with the photographer beforehand or at the event, be sure to chat and exchange business cards. This will open the door to requesting photos from the event that you can use to promote your own business. Keep track of the photographers you work with over time. This will make it easier to reach out after the event for photos, plus it’ll help you build relationships in your local market. You might find that you work with some photographers more than others, which can be a great opportunity for referrals. » 8 Must-Have Tips for Improving Your Storefront Photos – From the Editors! The Editorial Team’s role here at WeddingWire is to create content (like our SummerBook!) to entice and inspire couples, and as wedding professionals, your WeddingWire Storefront should do the same. Think of your Storefront as a magazine with you as the editor-in-chief, where you choose the the right photos and information to share. We spend a lot of time browsing WeddingWire Storefronts to look for Wedding Pros to interview and feature in our content (including our seasonal e-magazines! ), and we came up with these tips to make your Storefront even more appealing. You’re more likely to catch an engaged couple’s eye with clear, professional photos. We do not recommend including blurry photos taken with mobile devices on your Storefront. Even the most beautiful wedding element will look unattractive and unappealing with an unclear photo or an image that is cluttered with effects. Make sure to network and maintain good relationships with wedding photographers to obtain these images. Yes, we love to see beautiful photos of couples as much as the next person, but if you’re a beauty Pro, we want to see the back of the intricate hairdo you did, or a close-up of the bride’s make-up. Make sure that all of your Storefront photos relate to your services. If you offer multiple services (lighting, rentals, flowers) create separate photo albums that highlight each of those services, so if a couple/editor is using you for just one or two of them, they can get a sense of that service as it stands on its own! Let engaged couples get lost in all of your beautiful work! We say the more images you include, the better. Be sure to provide a variety of examples of different types of weddings in your albums to ensure that a couple can find images that match their style. All businesses want inquiries. Every Wedding Pro wants potential clients actively reaching out and requesting information about their services for their upcoming wedding or event. Simply creating a listing about your business doesn’t guarantee you business. It’s important that you develop, manage, and maintain your listing over time to maximize your business exposure and that you are showcasing your work to engage with interested parties. Here at WeddingWire, we often use a billboard analogy. If you buy a billboard on the highway and don’t put anything on it, that billboard is not going to bring about much business for you. You need to make sure that you have eye-catching content and information that pushes couples to contact you. Customer Success Managers and Account Managers are often asked by Pros, “How can I get more inquiries?” While there is no finite formula to get couples clicking and calling to encompass all Wedding and Event Pros, we do have some effective tips and best practices to drive interest and therefore, inquiries! In addition to considering premium placement, which lists your business before basic listings and highlights your account, having a ton of great reviews will help to bring potential clients to you Storefront. If you believe that you could be getting more inquiries from couples calling and emailing you saying they found you on WeddingWire, it could be time for a Storefront face lift. Swap out your Main Image. Even though your Main Image could be your favorite picture, it might not be helping to drive couples to your Storefront. Remember: couples looking at WeddingWire and our partner sites tend to respond to “aspirational” images. Your Main Image should showcase a couple or wedding party celebrating or using your product. Make sure that your pictures are bright, clear and colorful! Double check your Main Image in the vendor catalog after you choose it. You don’t want any important parts cut off or zoomed-in too far. Change your Tagline. Your Tagline appears along with your company name, Main Image and number of reviews in the vendor catalog. If you’re not getting the clicks that you want, change it up! Instead of saying “Since 1942” for your Tagline, try “Hosting Gorgeous Weddings for Decades…” Instead of “Photojournalistic and Editorial Photography” try “The Beauty of Your Big Day Captured for a Lifetime”. Edit your About Us section. Is your About Us section too long? Does it take several “scrolls” to get to where your Photos section is? Shorten it! Do you have only one sentence in this section? Add more content! Your About Us section should be a teaser that not only provides information about your company, but also pushes couples through to your website and to other sections of your Storefront. Make sure that there aren’t any typos or spelling errors and that the format looks clean. Pick new pictures. For premium members on WeddingWire, there are an unlimited number of albums and pictures that you can add to your Photos section. Upload a new album (or two) with 15-25 professional pictures and change the order of your albums. This way, you’re adding content for couples to click through. By swapping your old albums for your new ones, you’re changing the look of your listing. Add a video. Videos not only help to boost the SEO for your listing, but they also keep potential clients on your page for longer. Make new videos using the Video Builder, or embed videos from this past wedding season. Highlight a recent review. A lot of the time, upgraded Wedding Pros will highlight a review on their Storefront and never bother to choose a new one. It’s important that the review you have highlighted is not only flattering to your company, but it also should be from a wedding within the past calendar year to show you consistently get great reviews, and have recent experience. Most importantly: keep getting great reviews! Try using our Request Reviews Tool. You can also use our Reviews Widget and you can send out your Personalized Review URL to your past clients. All couples will want an idea of what to expect from your business. Make sure that you have a lot of examples! While sharing photos is not a novel concept, sharing photos through new social media tools doesn’t always come to mind. Sharing your pictures on Facebook, Twitter, and on your blog can help establish a more personal connection with past and potential clients. Not only will this help you to foster a relationship with those you already know, it could help your business find new clients after a friend shares one of your photos. 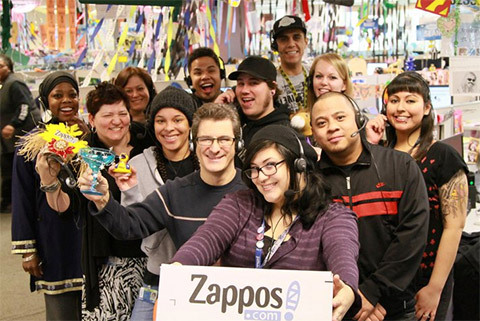 Share personal photos – This image from Zappos.com helps you establish a personal connection with the brand. Make sure you maintain your professional image but have fun and connect with engaged couples in a new way. Share Photos Others Will Share – Make the photos you post worthwhile and something you think others want to see, and hopefully want to share. Share it if you captured something unique or held an event with another business – they’ll be likely to share it as well if you tag them in your post! Share Your Involvement – As a local business it is important to connect with consumers in the same area. Post photos from a local sporting event or attending a benefit. These humanize your business and others can easily relate. Lastly, it is important to share your photos often so your fans, followers, and readers keep coming back. Do you have any great photos to share? Post the link below. Make it easy for potential clients to see your past work by uploading photos and video into your Portfolio. When a couple is searching for their vendor, they will compare a number of things, including examples of what you have done for others. By showcasing a variety of things you have done before, you will give a bride and/or groom a good idea of your range and style. Just another way to ensure they give you a call to book your for their big day!